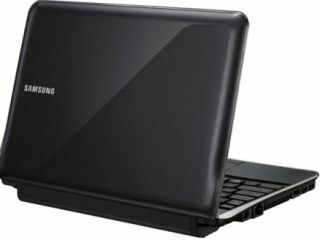 Samsung's new netbook range features better battery-life, faster processors and extra-tough new features for clumsy users! Samsung has beaten its mobile computing competitors to the CES punch, announcing a slew of new Intel Atom N450-powered netbooks which we should see lots more of in Vegas later this week. Samsung has announced not one, but four new netbooks, with notably improved battery life a key selling point for the new range of mini-puters. The new N210 and 220 apparently give users a splendid 12 hours of what Samsung refers to as "secure connected mobility," with the NB30 not too far behind with 11 hours and the N150 offering 8.5 hours. We'll be sure to put them all to the proper tests when we get them in for review. However, if those manufacturer's battery-life claims are anywhere near reality, then Samsung really has stepped up its netbook game. "The new netbooks' 10.1" LED anti-reflective display fine-tunes movies and images with the sharpest details and boldest colors, with no mirror effect under bright lights or in sunny weather," notes Samsung's press release. "Using the integrated Easy Resolution Manager tool, screen resolution can easily be changed if a program or game needs to be viewed in 1024x768. For added visual enhancements, the N210, N220, N150 and NB30 offer an integrated Digital LiveCam for video-conferencing or live messaging. "The N210 and N220 feature Samsung's new crystal pattern design, while the N150 sports an integrated hinge with smooth movement and high quality connection, so everything blends effortlessly together even when the netbook is open." And if all that wasn't enough for netbook fans, the new range also rocks "a mark and scratch-resistant durable casing to reduce the risk of damage," with the NB30 also featuring "an innovative hard disk drive (HDD) freefall sensor, which protects data by automatically parking the HDD if it senses the netbook dropping" and also incorporates a water-tight seal to prevent any damage from contact with up to 50cc of spilled water. So no more freaking out every time you spill coffee on your netbook on the train.